Do you have green fingers and experience with growing plants? Do you have some space in your garden or allotment where you could sow some wildflower pots/trays? 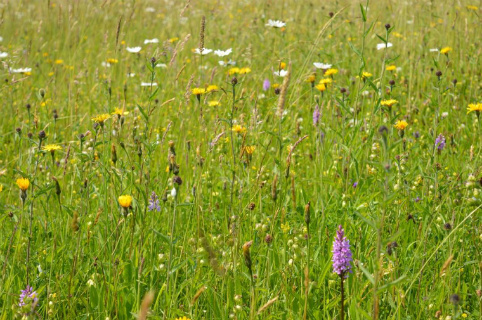 Would you like to help support wildflower meadow restoration? We have seed that our Glorious Grasslands volunteers collected from local wildflower meadows in the South West Peak and we are looking for people to help us grow the seed as plug plants. Once the plants reach a certain growth we will re-plant them into farm meadows to help restore their plant diversity, boost the range of nectar sources for wild bees, butterflies and other pollinators, and increase the populations of some increasingly uncommon wildflowers. We have seed for species including oxeye daisy, ragged-robin, hay-rattle, eyebright, common lousewort and sedges, but seed is limited and will be sent out on a first come first served basis. We can give you some guidance on how to sow the seed but there may be some trial and error involved! If you would like to get involved, please contact Ann Cantrell and she will be in touch to get you sowing & growing! You can also sign-up to this activity as a South West Peak Volunteer to get a the latest info on all the great volunteer activities we have on offer. You have until 30th November to sign up but on first come first served basis. Seed needs sowing before the Christmas holidays.